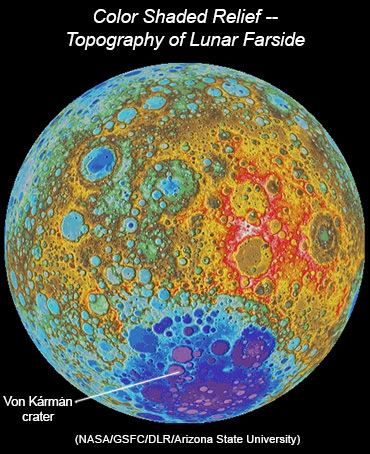 The intense interest surrounding the sampling of ancient materials from the lower crust or upper mantle of the Moon has a focus on the old, deep, South Pole-Aitken (SPA) basin on the farside – a rallying point because the oldest, deepest basin should have excavated the oldest, deepest rocks. The new, Chang'E-4 mission to the Moon plans to bring a lander and a rover for the first time to the lunar farside. The selected landing area is in the northwestern SPA basin, in Von Kármán crater. This highly anticipated launch, set for December 2018 from Xichang, is led by the China National Space Administration. Considering the lunar farside was utterly unseen prior to October 1959, we have since amassed substantial, detailed data of the farside from ambitious orbital missions (by multiple nations, see a list) carrying impressive suites of cameras and remote sensing instruments. The Chang'E-4 mission is poised to set 2018 as the year humanity begins to explore the farside on the ground. 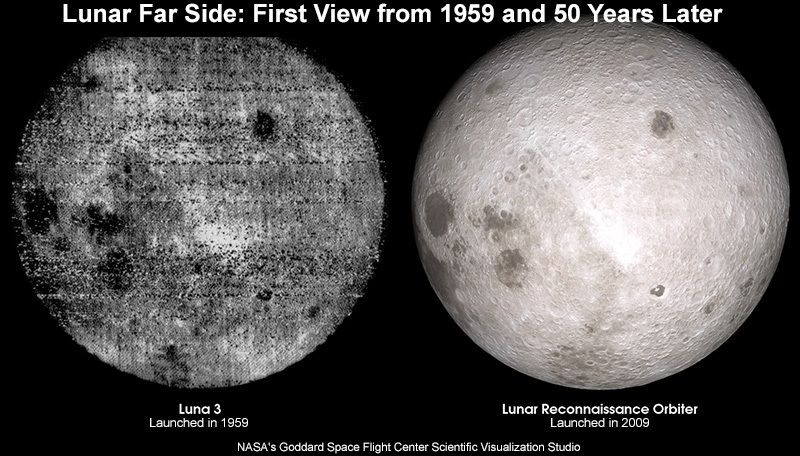 A comparison of the very first image of the lunar farside, acquired by Luna 3 in 1959, with a 2009 image acquired by NASA's Lunar Reconnaissance Orbiter. Both versions, centered at about 115o longitude, show nearside Mare Crisium and Mare Fecunditatis, as well as southeast nearside-edge mare (Smythii and Marginis) along the left side, and Mare Australe at the bottom. South Pole-Aitken basin was not visible in this first view. The Chang'E-4 mission's farside landing area in SPA basin, Von Kármán crater, is the subject of a recent geological review by Jun Huang (China University of Geosciences, Wuhan) and colleagues from China, France, the Netherlands, and U.S. This targeted area at 45.0–46.0oS, 176.4–178.8oE sits on mare basalt that filled Von Kármán crater. The deep, South Pole-Aitken basin is shown in shades of purples and blues in this color shaded relief map of the Moon's farside, centered at 180o longitude. Von Kármán crater is labeled. Map was created from the Global Lunar Digital Terrain Model from LOLA and WAC (Lunar Orbiter Laser Altimeter and Wide Angle Camera onboard NASA's Lunar Reconnaissance Orbiter) by NASA/GSFC/DLR/ASU. In their study of Von Kármán crater, Huang and coauthors describe the floor of the landing area as homogeneous mare basalt, spectrally dominated by pyroxene and feldspar, but no olivine. The mare could be composed of one or multiple lava flows. Most of the mare is superimposed by secondary craters and impact ejecta from nearby craters, including bright crater rays. The team estimates the topmost regolith layer ranges from 2.5 to 7.5 meters thick. Sinuous ridges and troughs also cross the area, though their mode of formation is unknown at present. Huang and colleagues also made crater-size measurements for size-frequency distribution plots to estimate the age of the landing-area mare, which resulted in an Imbrian age of 3.6 (+0.09, -0.2) billion years old. The Chang'E-4 landed mission is anticipated to carry among its suite of instruments a visible/near infrared imaging spectrometer, cameras, and two ground penetrating radars into Von Kármán crater. Data from these instruments could address outstanding questions about SPA basin composition and stratigraphy as well as more general questions about lunar impact processes. In the larger scope, could analyses of samples from Von Kármán crater eventually help constrain the age of SPA basin, and more broadly, basin formation chronology? The answer is a hopeful yes, as researchers think the 4.84-kilometer-deep crater could have excavated rocks melted during the huge event that formed the SPA basin. Hence, the anticipated, new in situ studies of Von Kármán crater could reveal whether we have found appropriate samples for a sample-return mission to allow dating of SPA basin. Endnote: Readers can learn more about the current ideas and priorities for lunar landing sites at the Lunar Science for Landed Missions Workshop that was held January 10-12, 2018 at NASA Ames Research Center. A partnership of NASA's Solar System Exploration Research Virtual Institute and the science-community-based Lunar Exploration Analysis Group, the workshop program has links to posters and oral presentation-videos. NEW: Chang'E 4 Rover Comes into View, February 8, 2019 post from LROC. Ling, Z., Jolliff, B. L., Liu, C., Bi, X., Liu, L., Qiao, L., Li, B., Shang, J., Fu, X, and Liu, J. (2018) Composition, Mineralogy and Chronology of Mare Basalts in Von Kármán Crater: A Candidate Landing Site of Chang'E-4, LPSC abstract #1939. Spudis, P. D. (3 January 2017) China's Moon Missions are Anything But Pointless www.airspacemag.com. Spudis, P. D. (14 June 2017) China's Journey to the Lunar Far Side: A Missed Opportunity? www.airspacemag.com. Xiao, L. (September 2018) Farside Landing and Nearside Sample Return: China's New Lunar Missions Are on the Way, The Planetary Report, September Equinox 2018, article from The Planetary Society. PSRD articles related to SPA basin. Lunar Science for Landed Missions Workshop (January 10-12, 2018). Written by Linda M. V. Martel, Hawaii Institute of Geophysics and Planetology, for PSRD.